If you know me, you know I love a good DIY! I’ll be real though… I’ve had quite a few Pinterest fails so I usually leave any crafty projects up to the experts at this point. 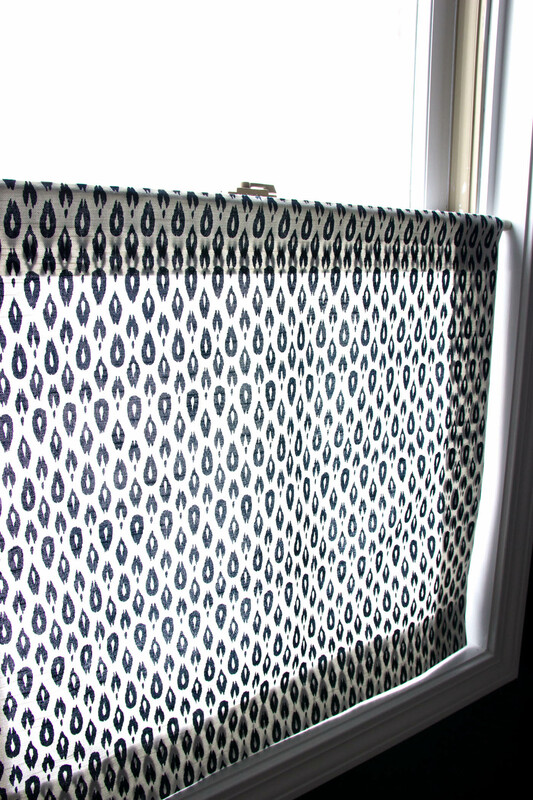 But I gave this privacy curtain a try since we needed something quick (more on that soon) and second, we were on a budget for our powder room makeover. 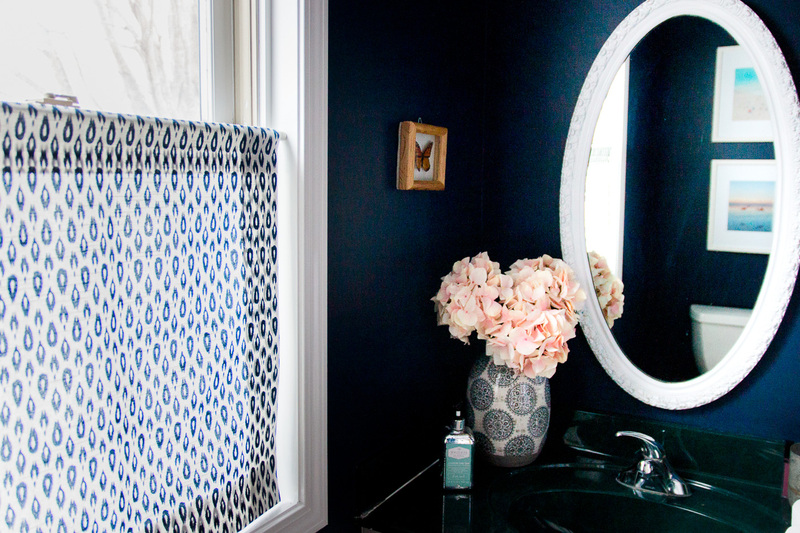 I’ll be sharing more details about our powder room makeover in an upcoming post – including tips on how we accomplished everything in less than 2 days. I don’t usually rush projects but I’m currently in nesting mode (pregnancy) and trying to get things done that we’ve been putting off. 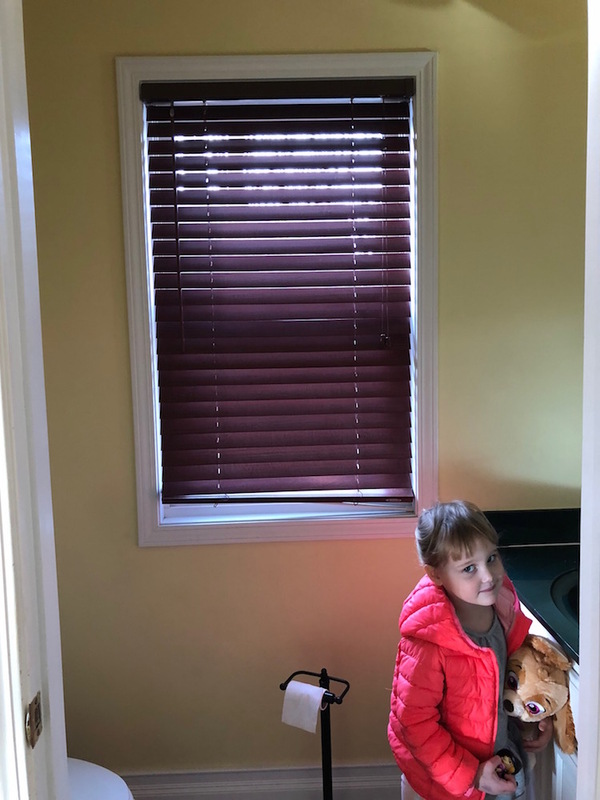 Our powder room was quite an eye sore with yellow walls, mismatched fixtures and brown blinds. Awful brown blinds. Here’s the BEFORE for reference…. Even Taylor knew those blinds had to go! Once we had the bathroom painted, those blinds were definitely not going back up. We needed a privacy curtain fast since this is our only bathroom downstairs. I had an idea of what I wanted and took a quick trip to JoAnn fabrics. The staff at our local store is always so helpful and they assisted with the amount of fabric I needed after giving measurements. 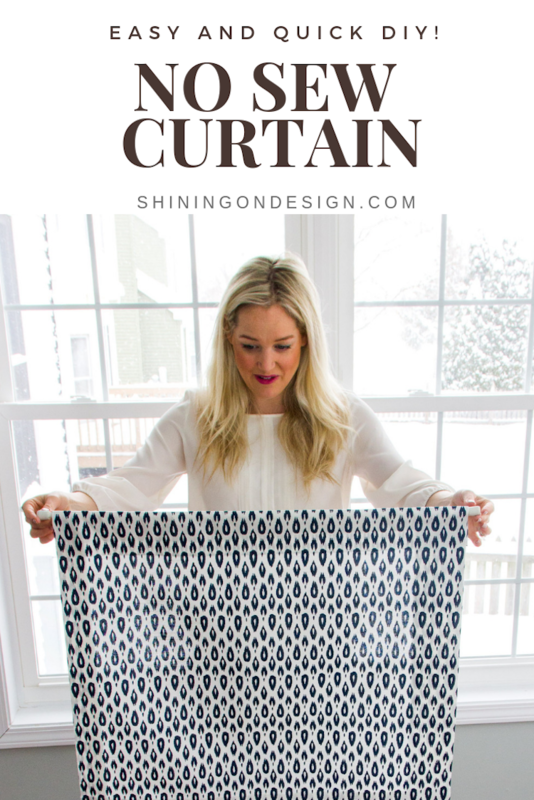 It turns out, these curtains are very easy to make! The most important part is measuring accurately. 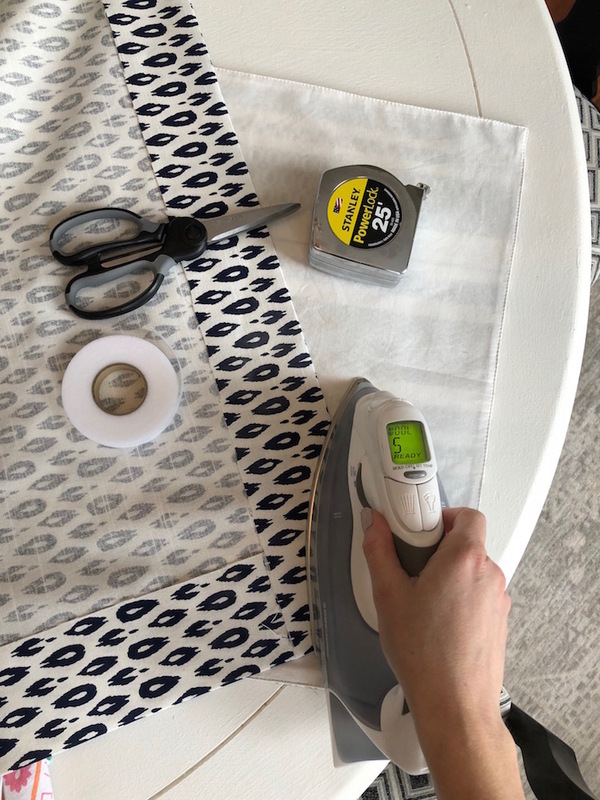 Once you have your window measurements and fabric, leave enough room to fold over the ends and apply the Stitch Witchery (aka the magic glue when you don’t sew!). Use your iron to adhere each side. I started with the sides, then bottom, saving the top (where the rod will slide in) for last. Be sure to leave enough space so your rod goes through!! The best part about this project is that it only costs $12!!! I already had most of the supplies (iron, scissors, curtain rod). I used 40% coupons for the fabric and tape. Always check this link for their coupons! Plus if you sign up for JoAnn’s newsletter you get an additional 20% off. And no, this post is not sponsored 😉 I just love a good deal! PS. The fabric we used is Indre Lynwood Navy by Nate Berkus. I’d love to see if you give this a try! This turned out so great, I can not believe it only cost $12 and love, love, love that it is no-sew! I love how it turned out! And I also really love that fabric pattern. Thanks Keki! Nate Berkus has some great prints! Thanks Katie! I wish I knew how to sew but until then, this taoe is magic!